Know where your mobile computer is all the time!How much did you pay for your laptop? Do you want it back if it is stolen? No other tracking software is as simple and proven. LaptopLocate.net is a software utility that will monitor a computer’s IP address to allow server administrators and general users to locate their computer. When a computer that has LaptopLocate.net is turned on, the IP address of the computer will be transmitted to a pre-determined location via email and logged for reference. This information is also transmitted to our servers and logged in the event your computer is ever stolen. 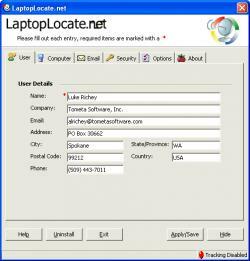 LaptopLocate.net is very helpful to find computers, especially mobile computers. If the computer is stolen, Tometa Software will coordinate with law enforcement agencies to help track down a registered user’s computer before valuable equipment and data is compromised. LaptopLocate.net uses almost no resources to run and after a quick 1 minute setup user’s can rest easy knowing their computer can be located anywhere or anytime.